Henrylito D. Tacio is the staff writer of the Mindanao Baptist Rural Life Center, Davao del Sur, the Philippines. He also works as a correspondent for the Press Foundation of Asia and writes a regular column for a local Davao newspaper. An agroforestry system appropriate for small-scale farmers in the Philippines has been developed, tested and disseminated by grassroots NGO. In the Philippines, government agroforestry-related projects are being implemented by the Communal Tree Farm and Social Forestry Programmes under the technical supervision of the Forest Management Bureau (FMB), a line agency of the Philippines Department of Environment and Natural Resources (DENR). Together with government agencies, NGOs have also been active in the development and implementation of agroforestry practices. One of these NGOs is the Mindanao Baptist Rural Life Center (MBRLC), a religious organization concerned with humanity's holistic (spiritual, social and economic) needs. Its main objective is to help small-scale farmers, particularly those situated in sloping upland areas. Located in the rolling foothills of Mount Apo in the southern part of the country, the MBRLC is in a typical humid tropical climate zone: the average rainfall is 2 500 mm per year; the altitude is about 400 m.
In discussions with local farmers in the late 1960s, both in formal meetings at the Center and during on-farm visits, low and declining farm yields were the foremost problems mentioned. Over a period of ten to 12 years, production of maize (the basic staple crop on hillside farms) had dropped from 3.5 to 0.5 tonnes/ha/year (Watson and Laquihon, 1985). Yields of other crops (banana, coffee, coconut and fruit-trees) had also dropped by more than 50 percent of over the same period. The underlying cause of this decline in productivity was severe soil erosion. In addition, the farmers often expressed the need for better income distribution throughout the year. There were times during the year when a family had no money or food since they depended on a seasonal monocropping system. Another problem expressed was a lack of ready cash for fertilizers, insecticides and seeds of improved varieties of maize and other crops. Recognizing these problems, in 1971 the MBRLC started to conceptualize a system now known in the Asia-Pacific region as sloping agricultural land technology (SALT). Food production was the top priority of this upland farming system which focused on small farmers. · be economically feasible and ecologically sound. 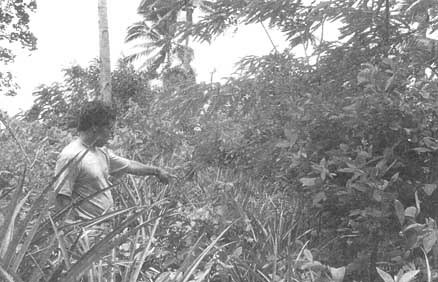 After testing different intercropping schemes and observing leucaena-based farming systems, both in Hawaii and at the Center, the SALT prototype was finalized in 1978. In SALT, field and permanent crops are grown in 4-5 m bands between contoured rows of nitrogen-fixing trees and shrubs, which are thickly planted in double rows to form hedgerows (see Fig.). Examples of hedgerow species are Flemingia macrophylla, Desmodium rensonii, Calliandra calothyrsus, Leucaena diversifolia, L. leucocephala, Gliricidia sepium and Sesbania sesban Farmers can also use any leguminous trees and shrubs found on their respective farms. When a hedge is 1.5 to 2 m tall, it is cut back to a height of 40 cm and the cut branches are placed in the bands between the hedgerows, also called alleys, to serve as mulch for conserving moisture and as organic fertilizer (green manure). Rows of permanent crops such as coffee, cacao, citrus and banana are dispersed throughout the farm plot. The bands or alleys not occupied by permanent crops are planted on a rotating basis with cereals (e.g. maize, upland rice, sorghum) or other crops (e.g. sweet potato, melon, pineapple) and legumes (e.g. mung bean, bush bean, soybean, peanut). This cyclical cropping helps maintain soil fertility and provides the farmer with several harvests throughout the year. Moreover, if a farmer leaves the land untended for one or two cropping seasons, the leguminous trees and shrubs will continue to grow and may later be harvested for firewood and charcoal. In 1978 a site of 1 ha was selected at the MBRLC to serve as a testing ground for the SALT scheme. This first hectare, which is still highly productive today, was eventually named Demonstration SALT. It was located on an average 25 percent slope with soils that were fairly typical of the area. The first few years of the model were spent in checking for adaptability of crops, crop production and soil erosion control. In 1980 a 0.5 ha Experimental SALT plot was established for the adaptation and modification of the SALT system. 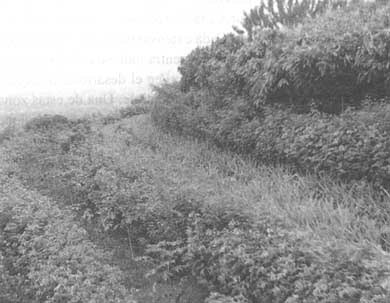 This was followed in 1984 by Test SALT (side-by-side comparison of SALT versus non-SALT) and Contour Hedgerow Test SALT (hedgerow species test). With regard to technological innovations, the MBRLC strongly adheres to the teaching-learning psychology, "what I hear, I forget; what I see, I remember; what I do, I know". Thus, SALT was put to public test: the MBRLC's SALT model farm was opened to the public in the early part of 1980, with Baptist churches and their entities designated as points of entry. Twelve farmers located near the Center (out of the initial 30 who were invited to attend a one-day SALT training seminar) adopted the technology on their respective farms. Support was provided in the former of seeds and materials as well as visits by the MBRLC extension workers. At present, 50 hillside farmers in the immediate vicinity of the Center have adopted the SALT methodology. In 1980 SALT became one of the 37 training courses available at the MBRLC. SALT training courses usually last from three to five days and the average number of persons in a group ranges from 20 to 35. Between 1980 and 1990, there was a steady flow of SALT training groups and graduates (Table 1). In addition to the training courses, about 10 000 farmers come to visit the MBRLC each year. During the tour, many of the farmers show such enthusiasm that they rush from one alley to another without waiting for the tour guide. The figures in Table 1, however, do not include SALT training conducted outside the Center or at its Baptist Outside-of-School Training (BOOST) programmes, in Davao del Sur, Agusan del Sur and North Cotabato provinces. Outside the MBRLC, SALT training is conducted by the Center's extension workers when requested by public or private organizations, institutions and groups. To further enrich the MBRLC's training, teaching aids such as leaflets, manuals, bulletins, flip charts and slides were developed. SALT's manual, How to farm your hilly land without losing your soil to erosion, has been translated by other Philippine NGOs into Cebuano, Tagalog and Chavacano - three of the major Philippine dialects. Non-church programmes, for the extension workers of SALT have also been successful. Currently, the MBRLC's Extension Program employs an '´impact area" strategy. Two extension workers have been assigned to each of four provinces (Davao Oriental, Davao del Sur, South Cotabato and North Cotabato). The extension workers select a village in which they concentrate their work in order to make an "impact" on the development of the chosen area. One impact area, located at the foothills of Mount Apo in Managa, Bansalan in Davao del Sur, now has about 200 SALT farmer-cooperators. In view of the swelling grassroots acceptance of SALT, many public and private organizations in the Philippines now believe in the potential of the system for upland development. Other NGOs are now promoting the adoption of SALT: Philippines Business for Social Progress (PBSP); World Vision Philippines (WV); Muslim-Christian Agency for Rural Development, Inc. (MuCARD); Meralco Foundation, Inc. (MFI); Mag-uugmad Foundation, Inc. (MF); World Neighbors; International Institute for Rural Reconstruction (IIRR); Kapwa Upliftment Foundation, Inc. (KAPWA); and many others. Most of these NGOs send their farmer beneficiaries and/or technicians to the Center for a three-day or one-week training course on SALT and other MBRLC technologies. In some instances, they also translate or reproduce the SALT manual. Other organizations have made use of SALT materials and disseminated the technology to their members. The SALT farms, established with the help of these organizations, now cover an area of more than 2 000 ha. 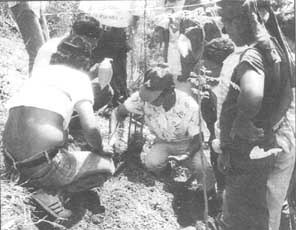 In the mid- 1980s, the Philippine Government launched a significant training effort for extension personnel, and SALT demonstration plots were installed on selected farmers' fields throughout the country. The Department of Agriculture, for instance, uses SALT as the basis for its extension effort in sloping uplands. The Department of Environment and Natural Resources (DENR) made it the technical basis for its social forestry pilot projects. To verify how effective SALT is in controlling soil erosion, in 1984 the MBRLC established Test SALT, a side-by-side comparison of SALT versus a non-SALT system. It is a duplicated test with individual plots measuring 40 m x 20 m. The final results of the study are recorded below. From Table 2 it can be seen that, whereas the non-SALT system resulted in a total of 1 162.4 tonnes of soil loss over six years, soil losses on the SALT farm were only 20.2 tonnes over the same period. This is almost 58 times less erosion. The annual average soil loss of 3.4 tonnes is well within the acceptable range for soil loss of ten to 12 tonnes per year in the tropics (Watson, Palmer and Laquihon, 1991). A study (1981-1990) conducted at the MBRLC indicated that the average annual net income per hectare for a farmer using the SALT system was more than triple that gained with a traditional monocropping system. Average annual income for upland farmers in the Bansalan areas was about p 4 000 (US$154). Under the SALT system, average income over the period was more than p 10 350 (US$398). The MBRLC also conducted tests on crop productivity, with an emphasis on maize, since it is the traditional upland crop in the Philippines, and particularly in Mindanao. The influence of leucaena "green manure" (harvested from the contour hedgerows) on maize yields and the way in which soils responded to continuous production were areas of MBRLC concern. In a first test, the effect of fertilizer (both leucaena biomass and commercial nitrogen fertilizer) were tested over eight croppings of a hybrid maize (DMR-2) commonly available in the area. Although commercial fertilizer was more effective (nearly tripling yields in relation to those of an unfertilized plot), yields from plots with leucaena biomass fertilizer were still more than double those from plots without fertilizer. The MBRLC also tested the effect of continuous maize production on land where only leucaena biomass was used as fertilizer. After ten continuous maize crops over a period of 39 months, the yield was slightly but not significantly lower than it had been with the first crop and still significantly higher than the national average. Based on observations of the first few years of work with the SALT scheme, it appeared that managing a l-ha plot under SALT required much more labour than a traditional maize plot. 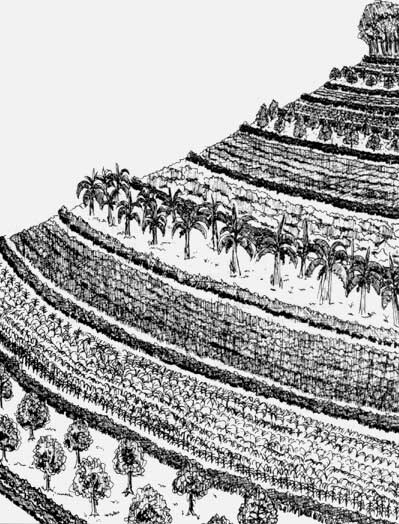 This was particularly the case during the establishment of the plot- locating the contour lines, preparing the seed-beds, planting leguminous trees and shrubs, trimming hedgerows, etc. However, later studies have shown that when averaged out over a longer period of time, annual labour requirements may actually be less than under a traditional system. One particularly important labour-saving aspect of the SALT system is the weed control inherent in the organic mulching. Nonetheless, the labour required to manage the hedges (pruning three to ten times per year) still absorbs a significant proportion of the household's available labour and may compete with other tasks. · Row Crop SALT system. The farmer only plants maize, beans other annual crops but not permanent crops in the alleys. Although planting permanent crops in every third alley will ultimately pay off in terms of soil saved and added income, Row Crop SALT may be more economical for the farmer in the short term. Moreover in the case of farmers who do not own the land, there is often resistance to planting permanent crops other than the contour hedgerow materials. · Permanent Crop SALT system. The farmer plants all the alleys with bananas, coffee, fruit trees or other permanent cash crops. The data available on this methodology are still insufficient to make long-term observations. However, the advisability of dedicating all land to cash crops as opposed to a combination with annual food crops is questionable. In 1985 the Ramon Magsaysay Foundation presented American missionary Harold R. Watson, MBRLC's director, with the prestigious Ramon Magsaysay Award (considered the Nobel Prize of Asia) in the international understanding category for "encouraging international utilization of SALT and other MBRLC technologies". In 1991 the MBRLC was chosen by FAO as recipient of the 1991 World Food Day Silver Medal. MBRLC also received a Certificate of Appreciation ''in recognition of the contribution to mobilizing people's participation in tree-planting and sustainable forest resources management". International NGOs, including World Vision and World Neighbors and international assistance agencies, such as the United States Peace Corps and USAID, have contributed to the international dissemination of SALT. Today. SALT farms have been established in Bangladesh Cambodia. India. Indonesia. Malaysia. Nepal. Sri Lanka. Thailand and Viet Nam. For example. Dr Ray Wi jewardene, a Sri Lankan officials wrote: ''In Sri Lanka, we have heavily eroded hillsides flanking our major river, the Mahawell Ganga. Now we have visions of more than 5 000 ha of rotationally farmed tiled tobacco and more than 50 000 ha of tea growing productively and sustainably in this area unties the SALT system (Wijewardene, personal communication). 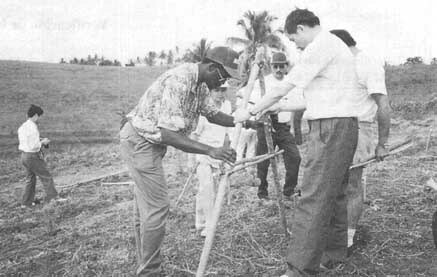 To satisfy the mounting level of international interest, in 1988 the Asian Rural Life Development Foundation (ARLDF) was launched by the MBRLC to promote international training and extension for the development of the uplands in Southeast Asia and the Pacific region. Since the opening of the ARLDF training facilities, there have been more than 500 inset national visitors to the MBRLC In either training or exchanges of information and experience The countries represented include: American Samoa, Bangladesh, Cambodia, China' Fiji. India. Indonesia' Malaysia. Nepal, Sri Lanka. Thailand and Viet Nam. In addition, the SALT training materials have been translated into the Bahasa language tot use in Indonesia. ''There is not and never will be one universal system for all farmers working under varying socio-economic and biophysical conditions. SALT is not a miracle system or a panacea. To establish a one-hectare SALT requires much hard work and discipline. It took many years to deplete the soil of nutrients and lose the topsoil: no system can bring depleted, eroded soils back into production in a few short years. The price of soil loss is poverty, but we have seen land restored to a reasonable level of productivity by using SALT." Readers wishing to obtain more information on SALT may contact the Mindanao Baptist Rural Life Center. PO Box 94, is 000 Davao City, the Philippines. Garrity, D.P., Kummer, D.M. & Guiang, E.S. 1991. The upland ecosystem in the Philippines: alternatives for sustainable farming and forestry. Study commissioned by the National Research Council Project on Agricultural Sustainability and the Environment in the Humid Tropics. Manila, National Research Council Project. Watson, H.R. & Laquihon, W.A. 1985. Sloping agricultural land technology (SALT) as developed by the Mindanao Baptist Rural Life Center. Paper presented at the Workshop on the Site Protection and Amelioration Roles of Agroforestry, 4-11 September. Institute of Forest Conservation of the University of the Philippines. Los Banos, University of the Philippines.